Kathie Shaidle is a Canadian treasure. This book will grab your heart while you travel with her in her illness. 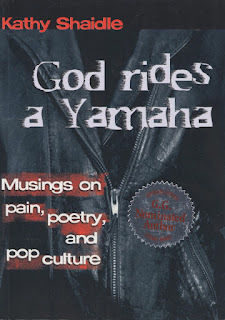 In this collection is a series of columns that were written after she was diagnosed with lupus. “’Quitting your day job’ is every artist’s dream. Mine came true in 1991, when some government arts grants let me write full time. Six weeks later, I contracted systemic lupus erthematosus, an incurable, life-threatening disease.” p.7 Now she cannot even live her dream job. At 26 she had reached her dream. She was writing full time, and looking forward to it. Then her life crashes around her feet. The pain was to the point that she could not even write. In these 26 chapters you will journey through pain, despair, hope, faith and doubt. With such chapters as ‘I’ve fallen and I can’t get up’ and ‘Confessions of a bearded lady’, the book will also uplift, encourage and make you smile and laugh. But to find out why God rides a Yamaha you will have to read the book.